Copyright © 2001, updated 2003. This work may be transmitted or stored in electronic form on any computer attached to the Internet or World Wide Web so long as this notice is included in the copy. Individuals may make single copies for their own use. All other rights are reserved. Nobody pretends that democracy is perfect or at all wise. Indeed, it has been said that democracy is the worst form of government except all those other forms that have been tried from time to time. 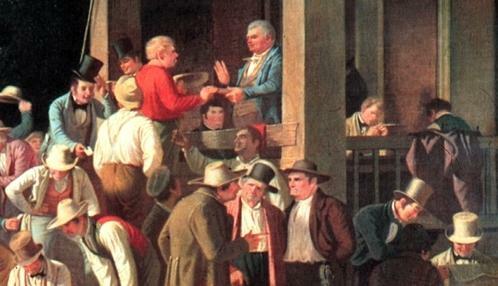 Figure 1: The County Election (detail) by George Caleb Bingham. The conduct of elections has changed in many ways over the past 200 years. The extent of these changes is nicely illustrated by a comparison of today's voting practices with those illustrated in George Caleb Bingham's painting, The County Election (Figure 1). 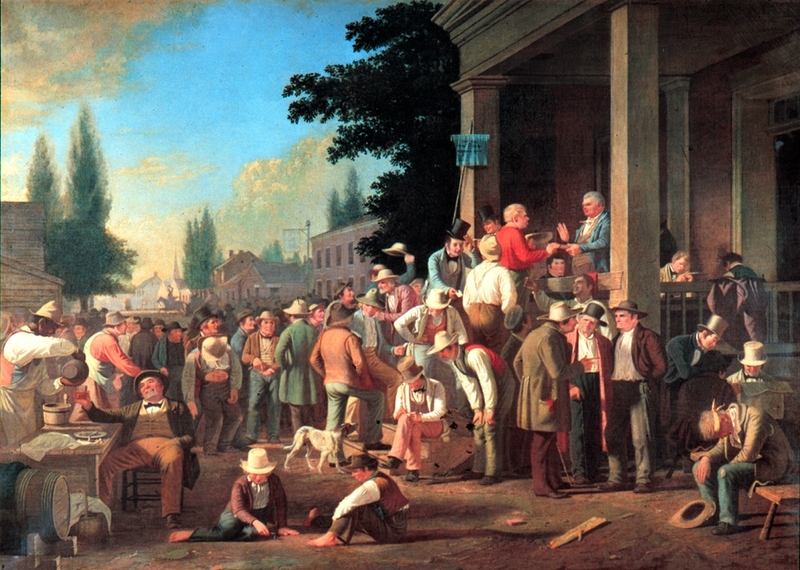 In addition to being a noteworthy artist, Bingham was a successful politician; this painting shows a polling place on the steps of the courthouse in Saline County, Missouri, in 1846. In this painting, we see the judge (top center) administering an oath to a voter. The voter (in red) is swearing, with his hand on the bible, that he is entitled to vote and has not already done so. There was no system of voter registration, so this oath and the possibility that the judge or someone else in the vicinity of the polls might recognize him if he came back was all that prevented a voter from voting again and again. There was no right to a secret ballot; having been sworn in, the voter simply called out his choices to the election clerks who sit on the porch behind the judge tallying the vote. Each clerk has a pollbook in which he writes the voter's name and records his votes; multiple pollbooks were a common defense against clerical error. There are several people in the painting holding paper tickets in their hands. We know that these were not paper ballots because Missouri continued to use voice voting until 1863. In a general election, however, many voters might have wanted to bring their own notes to the polling place. Campaigning at the polling place was legal and common. The man in blue tipping his hat to the voter immediately behind the man taking the oath is one of the candidates in this election, E. D. Sappington, who lost to Bingham by one vote. He's handing out his calling cards so that people can easily read off his name to vote for him. Voice votes offer modest protection against fraudulent vote counts: An observer can easily maintain an independent tally of the votes, and since there is no ballot box, it cannot be stuffed. On the other hand, the lack of privacy means that voters are open to bribery and intimidation; an employer can easily demand, for example, that his employees vote as required, and a crook can easily offer to pay a voter if he votes a certain way. 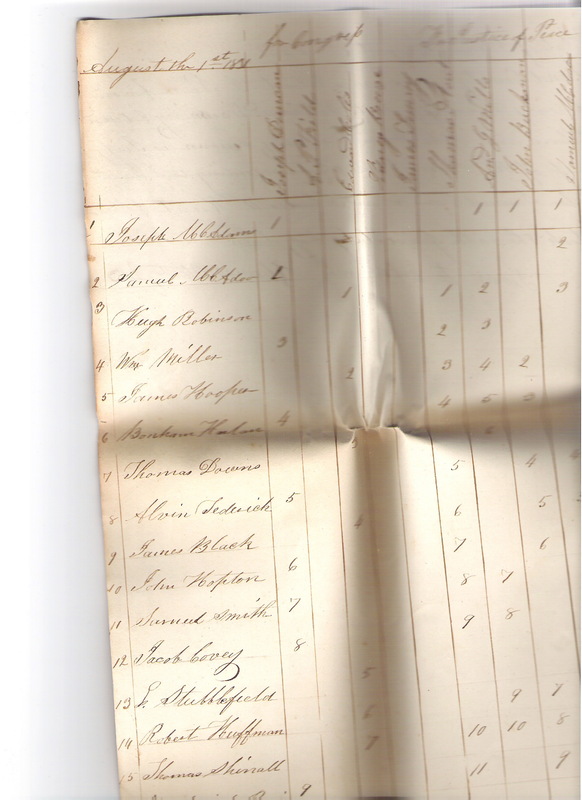 Kurt Hyde has sent me a scan of a page of a pollbooks in his collection from Bond County, Illinois; this contains the clerical records of a viva-voce election of the type shown in Bingham's painting. Candidate names are written across the top of the page, while voter names are written down the left hand side as the voters arrive to vote. Instead of tick marks to record votes, the clerk has written in the running vote total as each vote is cast. Kurt Hyde reports that most of the pollbooks in his collection reflect this practice. One man shall have one vote. The word ballot has been described as being derived from the diminuitive form of the word ball in Italian, ballota, and in fact, many early ballots were small balls. In classical Greek, however, the root is the verb for casting or throwing; indeed, we cast ballots, but the Greeks did not read this word as requiring that they be round balls. In ancient Athens, votes were taken by issuing clay or metal tokens to each voter, and the voter would vote by depositing the appropriate token in the appropriate ballot box, or perhaps in a clay pot that served as a ballot box. Since the renessance, secret societies such as the Masons have used identical round balls as ballots. The phrase to blackball someone comes from this usage. In a vote to admit someone to a secret society, each member was traditionally given a white ball and a black ball. Depositing the white ball in the ballot box was a vote for the candidate's membership, while depositing the black ball was a vote against the candidate. It follows that to blackball someone meant to vote to exclude them from the organization or to campaign for their exclusion in an upcoming vote. In the late 19th century, many early developers of voting machines continued to interpret laws requiring that election be by ballot as the requirement that elections be carried out by the use of little balls, so many early voting machines operated by depositing small balls in the appropriate containers as each voter cast a vote. The purpose of the mechanism was to prevent a voter from casting more than the allowed number of votes in each race, and to maintain separate ballot containers for each of the many candidates in each of the many races races in an election. The first use of paper ballots to conduct an election appears to have been in Rome in 139 BCE, and the first use of paper ballots in the United States was in 1629 to select a pastor for the Salem Church. By the time the 12th Amendment to the United States Constitution was passed, it is clear that the term ballot was routinely taken to refer to a slip of paper on which were written the names of candidates for office. The very fact that the 12th amendment requires the use of separate ballots to elect the President and Vice-President implies that the use of one ballot to elect candidates to more than one office was understood at the time. Of course, this amendment applied only to the electoral college and not to voting by the electorate at large. The Tennessee Acts of 1796, chapter IX section 3 gave the following definition: "[A ballot is] a ticket or scroll of paper, purporting to express the voter's choice, given by the voter to the officer or person holding an election, to be put into the ballot box." These early paper ballots were no more than slips of paper provided by the voters themselves, although it was not long before candidates or political parties began to provide preprinted ballots. This innovation was not always welcome. It took a state supreme court decision in Massachusetts (Henshaw v. Foster) in 1829 to legalize this practice in that state. It took a constitutional amendment in Connecticut, in 1844. The example shown in Figure 2 was apparently provided by Francis Gehon, a candidate for nonvoting territorial delegate to the United States Congress in the 1839 Iowa territorial election; the torn edges suggest that this ballot may have been printed as an advertisement in the newspaper. This ballot includes write-in blanks for the other offices in the election, the territorial house of representatives and various county offices. The printer omitted the office of Sheriff from the ballot, so the voter wrote this in at the very bottom. This form of paper ballot makes it very difficult to reconcile several requirements that we usually take for granted, the right to privacy, the requirement that the voter not disclose his or her vote, and the requirement that no voter deposit more than one ballot in the box. To maintain voter privacy, we must allow voters the right to insert their own ballots into the ballot box. Doing this, however, raises the possibility that a voter might deposit a handful of ballots. If we require voters to give their ballots to a polling place official, the official might read the ballot in the process of unfolding it to determine if other ballots have been cleverly concealed inside, or a dishonest official might add other ballots to the box. If a voter wants to disclose his votes, he may easily sign the ballot, and if we disallow this with rules that require signed ballots to be rejected in the count, the voter may simply arrange to use distinctive paper or a distinctive style of writing in order to identify his ballot to someone observing the count. Political parties quickly mastered the art of printing ballots on distinctive paper so that all voters using a party's ballot could be easily identified. Despite these serious problems, this style of voting on paper ballots remained the rule into the late 19th century. By the mid 19th century, it was standard for each political party in the United States to print a party ticket that listed all of the offices in the election, along with the candidates endorsed by that party. The word ticket was used because they resembled railroad tickets in size and printing style. 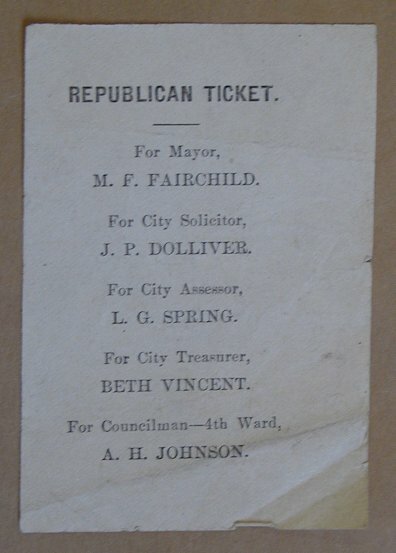 The municipal election ticket shown in in Figure 3 was printed by a local Republican party. Voters in this era were allowed to write out their own ballots, longhand, but the parties encouraged them to use the party ticket as a ballot. So long as a party representative got to a voter in advance to give him that party's ticket, voting a straight party ticket was easy. A voter who wished to split his ticket, that is to vote for candidates from more than one party, could write out the entire ballot longhand, or he could could cross out the candidates he didn't like on one party's ticket and write in the names of the candidates he preferred. By the 1880's, the parties had learned to format ballots to make it difficult to vote a spit ticket. The idea is quite simple: arrange the layout of the ticket so that a voter who crosses out a candidates name on the party ticket will have no space left to write in the name of any other candidate. Figure 4 illustrates a general election ticket formatted this way. Where the example in Figure 3 had ample space under each candidate name to write in a substitute name, this example has almost no space, except for the write-in blank for county treasurer, where the party had no nominee. A striking feature of the ballot in Figure 4 is that the typography, below the ballot title, is deliberately difficult to read. From the party's perspective, printing a ballot that invited close reading ammounted to an invitation to strike-out names and write in alternatives. The parties wanted voters to be loyal to the party, not the specific candidates, so the party name was always easy to pick out and read. Of course, the typography of the ballot could not be arbitrarily unreadalbe, the ballot had to be legible enough to tally. On the other hand, with party tickets, it is not necessary to closely read each ballot; instead, each ticket style need only be closely read once. The first step in the tally is to sort the ballots by ticket style; then, all ballots of a particular style would be counted, along with the number of strike-outs for each office on that ticket. Candidates on that ticket would then be credited with the number of tickets less the number of strikeouts. Finally, all write-ins, manuscript ballots and handwritten additions to ballots would be counted. The examples shown here are all printed on inexpensive paper - generally newsprint, but in large urban areas, it was very common for parties to print their tickets on distinctive paper. This had only one purpose, to make it very easy for a party observer at the polling place to note which party's ballot each voter was using. Ballot box stuffing was extremely common in many jurisdictions, and to prevent this, it was common to demand that ballot boxes be transparent, thus making it completely impossible for a voter to hide the color of the ballot being deposited. For an excellent discussion of the extent of vote fraud using such paper ballots, see the paper Harrison Count Methods: Election Fraud in Late 19th Century Texas by Worth Robert Miller, Locus: Regional and Local History 7, 2 (Spring 1995), 111-28. One of the best references on the pre-technological history of elections is Election Administration in the United States by Joseph P. Harris, published by the Brookings Institution in 1934. The book The American Ballot by Spencer D. Albright, published by the American Council on Public Affairs in 1942 is a much shorter work filled with extremely useful history but with very little of the critical content that makes Harris' book so valuable. The People's Charter: Being the outline of an act to provide for the just representation of the people of Great Britain in the Commons house of Parliament; embracing the principles of universal suffrage, no property qualification [for the right to vote], annual parliaments, equal representation, payment of members [of parliament], and vote by ballot, prepared by a committee of twelve persons, six members of parliament and six members of the London Working Men's Association, and addressed to the United Kingdom. Figure 5: The Chartist proposal for polling-place organization and a voting machine from the 1839 edition of the People's Charter. A remarkable feature of the Chartist demand was that one page of each Chartist pamphlet was a diagram of a polling place that included use of a voting machine, along with two schedules. Schedule A described the features of the polling place, including a description of the rolls of each of the people shown in the woodcut. Schedule B described the voting machine, described as a ballot box. The Chartists attributed their ballot box design to Benjamin Jolly of 19 York Street, Bath. Voters using Jolly's voting machine were to vote by dropping a brass ball (the ballot) into one of the holes in the top of the machine. Each hole was to be marked with a candidate's name. The ball, on passing through the machine, would advance a clockwork counter one step before dropping into a tray on the front of the machine, in clear view of the election judges. During the election, the counters would be sealed behind a closed door, so nobody could see the count until the polls closed, and the voter would vote behind a partition, so nobody could see which hole the ball was dropped into. If a voter brought an extra ball into the polling place, the judges would see two balls falling into the tray. You won the election, but I won the count. Concern about vote fraud and voter privacy was not restricted to England and the United States. One of the most important innovations in voting technology came about in Australia. In 1858, an election was held in the state of Victoria using standardized paper ballots that listed all candidates for office. These ballots were printed at government expense and distributed to the voters at the polling place, one per voter. This system, while obvious in retrospect, was sufficiently innovative that it came to be known as the Australian secret ballot. The Chartists had significant influence in Australia, and several of the Australian states had been experimenting with how to reduce the Chartist demand for secret ballots into practical form. All of the Australian experiments substituted printed ballots and a simple ballot box for the voting machine the Chartists proposed, but it is the Victorian model that later came to be seen as definitive. Today, the Australian ballot seems so natural that we take it for granted as ancient technology, and in much of the world, it is so firmly entrenched that replacing it with mechanical or electronic voting machines is unthinkable. Nonetheless, the benefits of the Australian ballot were not obvious at the time it was introduced. Use of this technology requires, after all, a special print run at government expense, plus the cost of secure ballot storage and transport. In the United States, it is likely that the widespread fraud reported in the general election of 1884 was the major impetus behind the first adoption of new voting methods in 1888, but this level of fraud would probably have gone unnoticed if it hadn't been for the election upset of 1876. In that year, Rutheford B. Hayes won an majority of the electoral vote with only a minority of the popular vote, and just as with the 2000 general election, this focused popular attention on the problems with the election methods then in use. The hearings into Boss Tweed's dealings in New York, published in 1878 are likely to have been another contributing factor; there, Tweed admitted quite openly to completely ignoring the ballots and having his ward bosses simply announce the requested result. So, it was in 1888 that the Australian ballot was first used in the United States, in New York and Massachusetts, and it was also in 1888 that the lever voting machine was first used. The example Australian ballot shown in Figure 5 allows straight-party voting by a single X in the circle by the party name at the top of the column, or a split ticket vote by marking an X in the box by an individual candidate name. Figure 6: Australian Ballot from a 1916 Democratic primary in South Carolina. The move to the Australian ballot was not instantaneous. Texas and Connecticut moved by gradual reform of the partisan ballot, completing their changes in 1905 and 1909. Missouri experimented with the Australian ballot but reverted to partisan ballots until 1921. New Mexico finished a gradual migration from partisan ballots in 1927. North Carolina only required that all counties use the Australian ballot in 1929. By 1940, Delaware still had a mixed system where partisan distribution of ballots was still allowed outside the polling place, and South Carolina was still voting on partisan ballots, although their size, color and typography were strictly regulated. While most Australian ballots ask the voter to mark an X or checkmark in the voting target beside the candidate's name, where the target is either a box or a circle, the original form of this ballot asked the voter to scratch out the names of all but the preferred candidates. The use of an X mark to vote for a candidate was introduced in West Australia in 1877. The older pattern persisted for many years in a number of Southern states, most notably Arkansas. The example in Figure 6 illustrates this. The scratch-out ballot variant would have appeared quite natural to those accustomed to voting with party ticket ballots where voters could scratch out the names of the party nominees they did not support. There is nothing particularly wrong with this variant, but when a juristiction changes from this rule to the more common mark-in-target rule, there are special voter education problems. Corrupt politicians and political machines have always been quick to search out and exploit the weaknesses of new voting methods, and it was not long before the weakness of the Australian ballot was uncovered. Properly administered, the Australian ballot does indeed make it very difficult for voters to cast multiple votes or for a dishonest election administration to stuff the ballot box, but the greatest weakness of the Australian ballot lies in how votes are counted. This weakness was the focus of the Supreme Court decision that followed the 2000 general election. The Australian ballot requires a subjective interpretation of each mark on the ballot, so if corrupt officials cannot control the ballots that land in the ballot box, they may still try to control how they are counted. Typical counting procedures attempt to prevent this, first by allowing observers at the count so that any bias will be out in the open, and second, by requiring that each tally team be composed of representatives of opposing parties, each monitoring the other. Even with these precautions, a corrupt election administration can introduce bias into the count by manipulating the makeup of the tally teams and by instituting carefully crafted objective standards governing what marks on the ballot count as votes. The Michigan law current today (2001, see MCL 168.803) provides an excellent example of "an objective and uniform standard" that allows such a biased count. This law requires that each vote be made with either an X or a checkmark, where the intersection of the X or the corner of the checkmark is within or on the border of the box provided on the ballot. This standard seems excellent, but as a consequence, many marks a voter could make on the ballot that express clear and obvious intent are disallowed. A hurried checkmark where the vertex is rounded and not sharp, or an X or check that is obviously intended to be in a particlar box but is just outside that box may, under these rules, be discounted. If an entrenched political machine wishes to remain in power even when their support from the voters is questionable, all they need to do is assure that their representatives on each tally team are well trained in the selective exclusion of votes for the opposition using these rules, while the representatives for the opposition selected for each tally team are relatively niave and generally willing to accept the obvious intent of voters. By the time the oppostion members of the tally team understand the game that is being played, it is likely that they will have already lost the election. The problems with the Australian Paper ballot can largely be overcome by strict accounting requirements, specifically, by the requirement that the official election canvass include not only the counts of the votes that all agreed were acceptable votes for one or another candidate, but also counts of the numbers of undervotes and votes not counted because of improper marking. If the latter number exceeds the margin of victory of the winning candidate, there is good reason to request a careful recount, and if these numbers add up to a number in excess of the number of voters who came to the polls, a ballot box has been stuffed. A properly administered Australian paper ballot sets an extremely high standard that any competing election technology must match, but in a general election such as those in the United States, where a single ballot may include over 50 individual candidates and questions on the ballot, hand counting can be a very expensive proposition. the right to vote today is far more than the right to pull that lever on election day. It is the right to an equal and meaningful vote, which includes the right to equal and meaningful participation. The Myers Automatic Booth lever voting machines was first used in 1892 in Lockport, New York, and lever machines descended from this were slowly adopted across the country. In the words of Jacob H. Myers, this machine was designed to "protect mechanically the voter from rascaldom, and make the process of casting the ballot perfectly plain, simple and secret." By the 1930's, essentially all of the nation's larger urban centers had adopted lever voting machines, and in the election of 1944, Automatic Voting Machine Corporation advertising claimed that 12 million voters used their machines. In states such as Iowa, smaller rural counties never abandoned hand-counted Australian paper ballots. In other states, particularly where there were serious charges of election fraud in the first half of the 20th century, lever voting machines were installed statewide. This happened in Louisiana, for example, in the 1950's. In the 1890's, lever voting machines were on the cutting edge of technology, with more moving parts than almost anything else being made. As such, they were as much of a high-tech solution to the problem of running an honest election as computer-tabulated punched cards in the 1960's or direct-recording electronic voting machines in the 1990's. Figure 7: Patent illustration for a lever voting machine. Two manufacturers split the market for lever voting machines, Shoup and AVM (Automatic Voting Machines); the latter company is the direct descendant of Jacob H. Myers original company, organized in 1895. Ransom F. Shoup made a number of improvements to lever voting machines between 1929 and 1975. Figure 7 shows an early Shoup machine; like most of its successors, this included a substantial voting booth, yet it could be collapsed into a package that was relatively easy to transport and store. The most visible difference between the AVM and Shoup machines was in ballot layout: Both used a tabular ballot layout, with the lever at the intersection of a particular row and column used to record a vote for a particular party's candidate for a particular office; in the Shoup machine, one column is assigned to each party and one row to each office, while in the AVM machine, the role of rows and columns is reversed. Lever voting machines were so pervasive by the mid 20th century that most of us born in midcentury grew up assuming that all voting machines were and would always be lever machines. Today, although they have been out of production since 1982, these machines are still in extremely widespread use. They completely eliminate most of the approaches to manipulating the vote count that were endemic a century ago, and they can easily be configured to handle a complex general election ballot. A lever voting machine completely eliminates all questions of ballot interpretation. At the time the voter opens the machine's curtain to leave the voting machine, it adds one to the counter behind each lever that was pulled down by the voter, and then it resets all the levers. The lever voting machines of the mid 20th century included interlocks to prevent a voter from overvoting -- that is, voting for more than one candidate in a race, and the voting booths that were integral to the machines offered what most voters considered excellent privacy. Unfortunately, the mechanism of a lever voting machine maintains no independent record of each voter's ballot. Instead, the only record of a vote is the count maintained on the mechanical register behind each voting lever, where each register has a mechanism comparable to the odometer in a car. Not only is this vulnerable to tampering by the technicians who maintain the machine, but it means that the machine has an immense number of moving parts that are subject to wear and very difficult to completely test. Roy G. Saltman has noted that the number 99 shows up in the vote totals on lever machines significantly more frequently than would be expected if vote totals were randomly distributed -- that is, the number of 99's is noticably different from the number of 98's or 100's. The probable explanation is that it takes more force to turn the vote counting wheels in a lever machine from 99 to 100, and therefore, if the counter is going to jam, it is more likely to jam at 99. The fact that this is a frequent occurance in vote totals reported from lever machines is empirical evidence that the lever machines that have been used in real elections are, in fact, inadequately maintained and that this results in the loss of a significant number of votes. Exhaustive pre-election testing would be expected to detect these jams, but exhaustive testing of a mechanism as complex as a lever voting machine is very time consuming, and performing such tests on every voting machine prior to every election would be prohibitively expensive. ... one card for every individual enumerated, in which holes are punched according to various possible answers to questions contained in the schedule. The standard punched card, originally invented by Herman Hollerith, was first used for vital statistics tabulation by the Baltimore Board of Health. After this trial use, punched cards were adopted for use in the 1890 census. Hollerith wasn't working in a vacuum. His idea for using punched cards for data processing came after he'd seen the punched cards used to control Jaquard looms. IBM developed pre-scored punched cards and the Port-A-Punch card punch. In the early 1960's, two professors at the University of California at Berkeley adapted this for voting. Joseph P. Harris, from the political science department, had the idea, and sought help from William Rouverol, of the mechanical engineering department. They made several improvements to the Port-A-Punch, patented them, and formed Harris Votomatic, Inc. to sell the result. After a large-scale trial at the Oregon State Fair, the system was used in primaries in Fulton and DeKalb Counties, Georgia; By the general election that fall, several counties in Oregon and California had moved to this new technology, and things looked promising enough that, in 1965, IBM bought the company. The Votomatic ballot shown in Figure 8 has 235 voting positions. Other ballot layouts support 228 and 235 voting positons. No matter what the layout, the preprinted information on the Votomatic ballot contains little more than voting-position numbers. The actual names of candidates and the text of ballot questions is not printed on these ballots, but rather, must be provided elsewhere, either on the ballot label attached to the Votomatic machine, or in a booklet provided with the ballot when it is used for absentee voting. 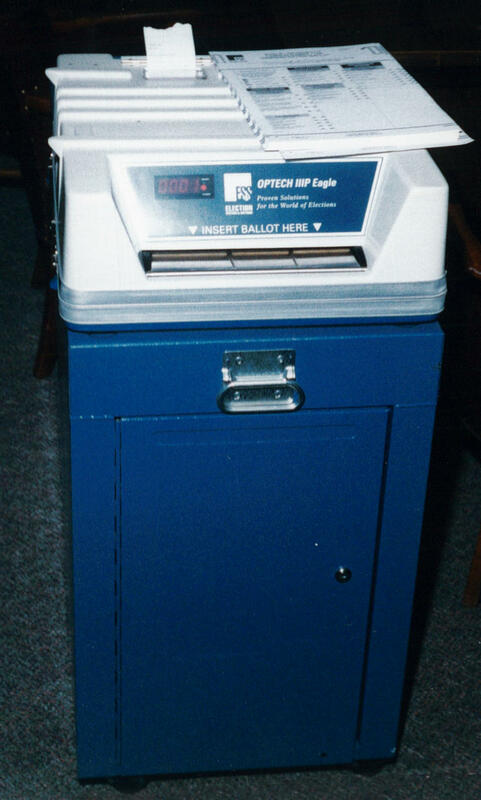 The Votomatic machine shown in Figure 9 is essentially the same as the original IBM Portapunch, mounted vertically in a panel that is designed to be integrated into a voting booth. The entire booth, consisting of the machine itself, plus sides, back and legs. These booths are well enough designed that many jurisdictions that have abandoned the Votomatic ballot have retained the booths, replacing the Votomatic machine with a tabletop that can be used with their newer voting system. The Votomatic ballot is pre-scored at each voting position so that punching with a stylus through that position into an appropriate backing will remove a rectangle of chad, leaving a hole that is counted as a vote. The backing used inside the Votomatic machine is a complex structure of elastomeric strips, and the stylus has a relatively comfortable handle on it. When used for absentee voting, a disposable styrofoam sheet is generally used as backing, and in some jurisdictions, the stylus for absentee ballots is an unbent paperclip. The ballot card is held in proper alignment in the Votomatic machine by holes in the ballot stub that fit over pins at the top of the machine. When the ballot is inserted in the machine, the face of the machine completely covers the ballot, with the exception of small holes over those voting positions relevant to the current election. The pages of the ballot label are hinged to the face of the machine; when the book made up by the pages of the ballot label is open, one column of voting positions on the ballot is exposed. 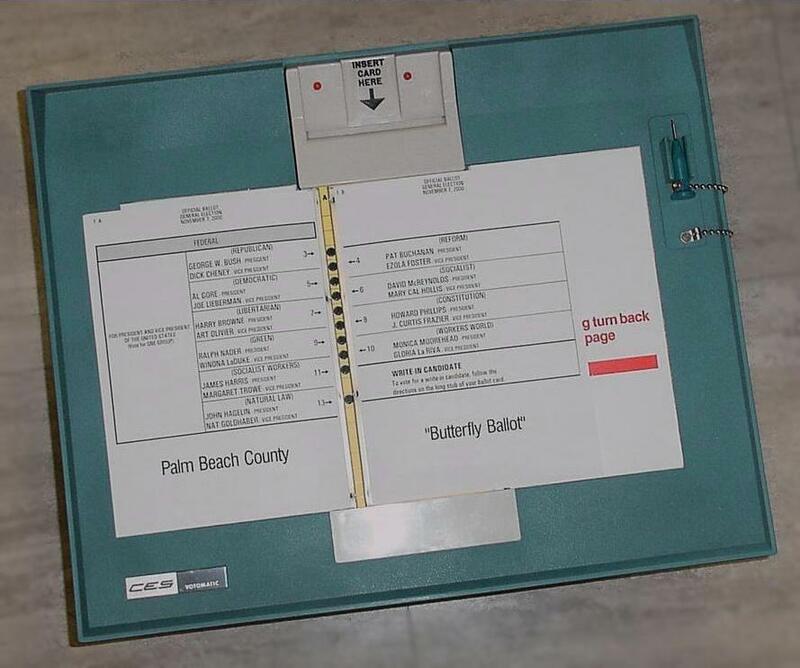 The ballot label mounted on the machine shown in Figure 9 is a replica of the first two pages of the notorious "butterfly ballot" used in Palm Beach County Florida during the 2000 general election. 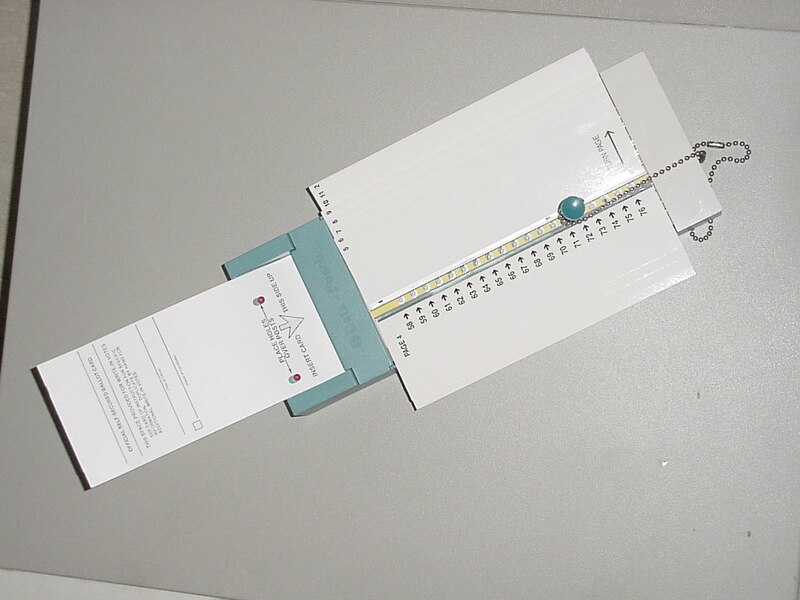 Figure 10: A Data Punch voting machine with ballot. IBM got out of the Votomatic business in 1969, after problems with this technology began coming to light. Later Votomatic machines (including the one pictured) were made by Computer Election Services Inc. and several other IBM licencees. CESI was later absorbed into Election Systems and Software. Similar mechanisms were made under the Data-Punch trademark by Election Data Corporation of St. Charles, Illinois. The example Data-Punch machine shown in Figure 10 is far closer to the original IBM Portapunch than the Votomatic machine in Figure 9. Unlike the latter, it is not integrated into the voting booth, but rather, can be used loose on a desktop. This machine in Figure 10 has has a full book of ballot labels mounted on it, but they are generic pages with only the positon numbers printed on them. Both the ballot cards and the hinged ballot label holders used with this machine are completely compatible with those of the Votomatic machine, and in some jurisdictions, both machines have been used interchangably. The Data-Punch machine in Figure 10 has a 228 position Votomatic ballot inserted in it, and the punching stylus has been pushed through voting position 72. Note how the alignment holes in the ballot stub fit over the red alignment pins on the machine. 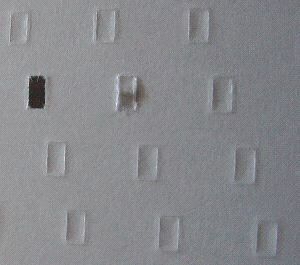 The actual punched-card portion of the ballot is entirely hidden inside the machine; only the tear-off stub is visible. In addition to the alignment holes, the stub also contains a blank for write-in votes, and when the stub is folded over along the perforations that separate it from the ballot, it serves as a privacy cover, hiding both the write-in votes, if any, and any holes that have been punched. At the far end of the ballot stub is a small tear-off tab. The details of how this is used vary from one jurisdiction to another, but the following is typical: the tear-off tab is serial numbered; the number on the tab is recorded when the ballot is issued to the voter, and after the voter has voted, the tab is checked against the pollbook to see that the voter is returning the same ballot that was issued. This is a defense agains chain voting, a vote buying scheme in which a crook gives the voter a pre-voted ballot, the voter votes that ballot, and then after leaving the polling place, sells his blank ballot to the crook, who votes it and then gives it to the next willing participant. Once the tab has been used to verify that a voted ballot is legitimate, it is torn off and the ballot, with the stub still folded over to hide the votes, is deposited in the ballot box. When the time comes to count the ballots, the stubs are unfolded and any ballots that contain write-in votes are separated so that the write-ins can be hand-tabulated. The ballots are then separated from the stubs and stacked for tabulation. The tabulation may be done either by a computer equipped with a standard punched-card reader or by an electromechanical punched-card tabulating machine. Problems with Votomatic technology have been known since the late 1960's. It is common to notice a few pieces of chad accumulating in areas where Votomatic ballots are being processed, and each of these may represent a vote added to some candidates total by accident. Roy Saltman of the National Bureau of Standards published several reports in the mid 1980's calling for the abandonment of Votomatic technology because of these and other problems, but these reports were ignored by all but a few. 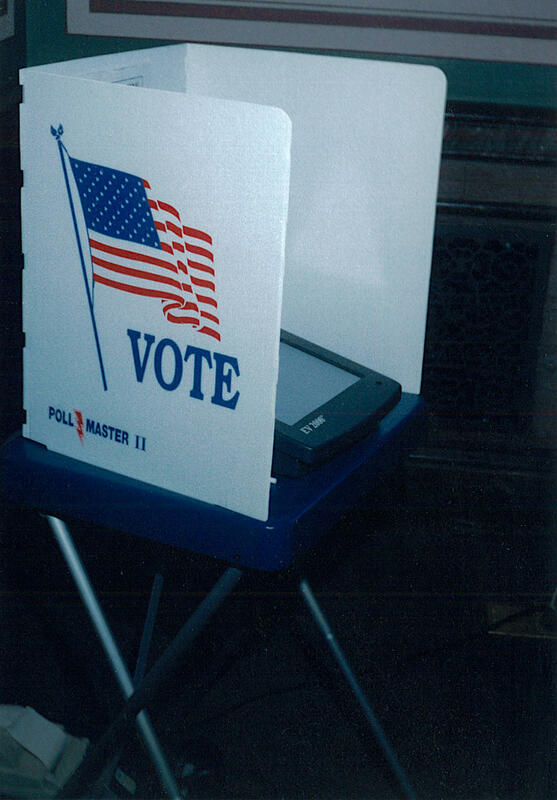 It was not until the general election of November 2000 that problems with the Votomatic voting technology became the subject of widespread public discussion. 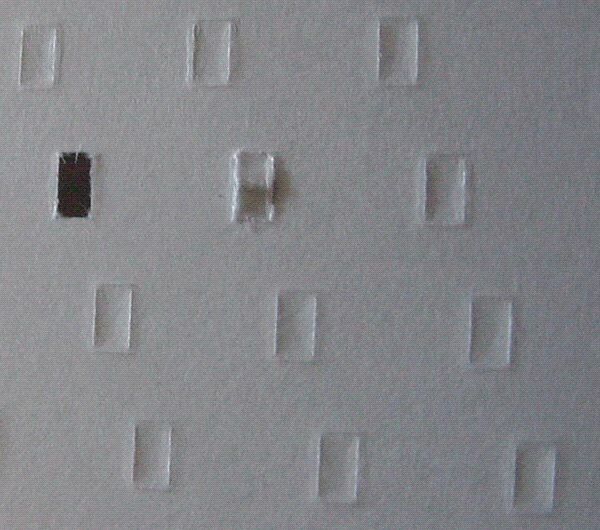 The focus of much of this discussion was dimpled chad; Figure 11 shows a cleanly punched hole and a dimple in a 228 position Votomatic ballot. It is noteworthy that 12 punch positions on the 228 position ballot are directly over internal braces inside the Votomatic mechanism, and that these positions are particularly prone to the development of chad jams that may prevent clean punching in those positions. The problem with such dimples during a hand recount is that, unlike the case with the classic Australian ballot, it is difficult for a human looking at such a dimple to determine the voter's intent. Every literate person has had years of experience evaluating pencil marks on paper, but very few people have had more than passing exposure to the problems of evaluating bits of chad. It is possible but unlikely that a dimple could be caused by voter hesitation, where the stylus was gently pushed against that voting position and then withdrawn. It is also possible but unlikely that the voter pushed hard enough to create a clean punch while there was something obstructing the hole. It is possible to distinguish between these two cases by microscopic examination using of the back of the dimple, but few have the expertise to do this. When used to cast absentee votes, DataVote ballots are prescored, just like Votomatic ballots. When used in the polling place, DataVote ballots are punched using an inexpensive formed sheet-metal punching fixture that holds the ballot in alignment and cleanly punches a hole. Although voters need some training to learn to align the punch properly, this system avoids all of the chad problems of the Votomatic and has performed very well in the small fraction of all jurisdictions that have used it. Mark-sense scanning has its roots in the world of standardized testing. In 1937, IBM introduced the Type 805 Test Scoring Machine, sensing graphite pencil marks on paper by their electrical conductivity. These were used for the first generation of machine-scored educational tests, most notably the SAT. This remained in use into the 1950's. Optical mark-sense scanning was developed as an alternative to IBM's electrical system. IBM had explored optical mark sensing in years earlier, but Professor E. F. Lindquist of the University of Iowa developed the ACT exam and directed the development of the first practical optical mark-sense test scoring machines in the mid 1950's. The rights to this technology were sold to Westinghouse Learning Corporation in 1968, and in 1974, Robert J. Urosevich of the Klopp Printing Company visited the Westinghouse offices in Iowa City and initiated Westinghouse's experiments with using their mark-sense tabulators to scan ballots. 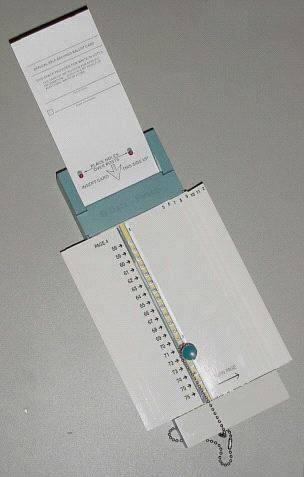 The first use of mark-sense ballots was in 1962, in Kern City, California, using a mark-sense system developed by the Norden Division of United Aircraft and the City of Los Angeles. Development of this 15,000 pound system began in 1958 and commercialized as the Coleman and later Gyrex Vote Tally System. The system remained in use in Orange County for over a decade. The system also saw use in Oregon, Ohio and North Carolina. Another early development was the Votronic ballot tabulator, an optical mark-sense voting system that was used in San Diego in 1964 and was used in many California counties in 1968, and also approved for use in Ohio. When compared to earlier scanners, the Votronic was small and easy to operate. Although originally incorporated as Votronic Corporation, Cubic Corporation adsorbed the company in 1964. This was the first vendor to sell reasonable numbers of mark-sense ballot tabulators. The Westinghouse system, based on the Westinghouse Learning Corporation M-600 page scanner, was developed in conjunction with Data Mark Systems and was first used for an election in Douglas City Nebraska in 1976. 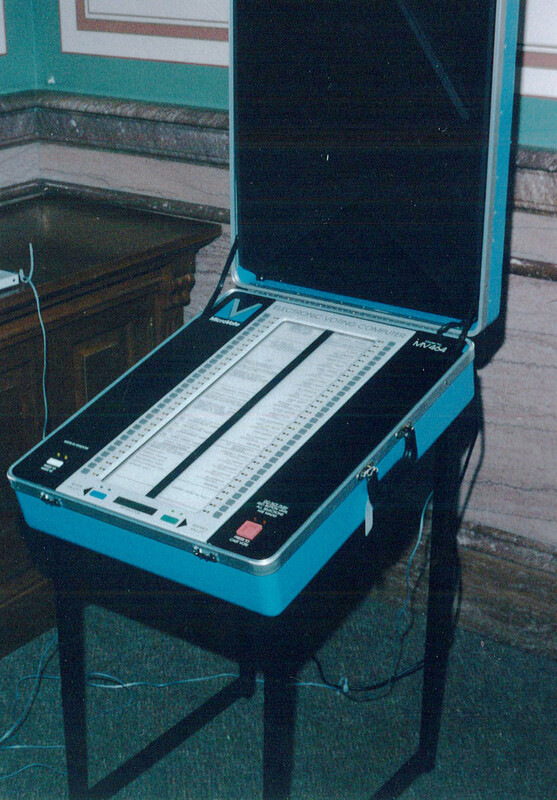 In 1979, American Information Systems emerged from the ashes of this venture and in 1982, the AIS model 315 central-count ballot tabulator saw its first official use in several Nebraska counties. In 1997, AIS was reorganized as Election Systems and Software after merger with Business Records Corporation. The ballot scanner shown here, made by Election Systems and Software is typical of central-count optical mark sense systems. The model 150 and 550 differ in speed; the 150 is slower, suitable for small counties and for processing absentee ballots that have been folded for mailing, while the 550 and later 650 are faster, more appropriate for large counties. In use, ballots to be counted are loaded on the tray to the right (shown with a few ballots in place) and then they are automatically fed through the reader mechanism and ejected into the output tray on the left. The scanner includes, within its body, a complete computer system, and it sits on a wheeled cart that also holds a printer and supplies. The Optech IIIP Eagle originally made Business Records Corporation and later (as a result of merger and an antitrust decision) by both Sequoia Voting Systems and by Election Systems and Software is typical of modern precinct-count optical mark-sense ballot scanning systems. The machine in the photo consists of two major parts, the ballot box (blue) and the head (white). The box is just that, a secure container for the ballots the machine has counted, while the head contains the scanner and electronics. The ballot box on the Eagle and most other precinct-count ballot tabulating machines contains three compartments. One compartment holds ballots that were not scanned by the machine. This compartment is considered an emergency feature; it is intended that it be used only if the scanner does not work, and in normal use, it is sealed shut. After the polls are closed, any ballots deposited in this compartment are typically fed through a working scanner by the precinct election workers or they are subject to a hand count. Ballots are diverted into one or the other of the two remaining compartments inside the ballot box by a software controlled diverter mechanism. One compartment is for ballots that do not require human inspection, while the other is for ballots that must be hand inspected, for example, those containing write-in votes. The first proposals for electrical vote recording date back to the mid 19th century. In 1850, Albert Henderson patented an electrochemical vote recorder for legislative roll-call votes (U.S. Patent 7,521). This system allowed legislators to vote by holding down either the aye or nay telegraph key on their desk to remotely print their name in either the aye or nay column on a piece of damp blotter paper that served as the official record of the vote. Edison refined this idea in his 1869 patent by adding electromechanical counters to count the votes (U.S. Patent 90,646), and in 1898, Frank S. Wood proposed a push-button paperless electrical voting machine for use in polling places (U.S. Patent 616,174). Occasional patents for such machinery continued to be filed over the next 70 years, but none of these appear to have come to anything until McKay, Ziebold, Kirby et al developed their electronic voting machine in 1974 (U.S. Patent 3,793,505). This machine, known commercially as the Video Voter, was first used in real elections in 1975, in Streamwood and Woodstock Illinois. Following these demonstrations, several Illinois counties purchased the system and used it between 1976 and 1980, approximately. This system was probably the first direct-recording electronic voting system to be used in a real election. The Electrovote 2000 voting machine sold by Fidlar-Doubleday (formerly Fidlar and Chambers) is a wedge shaped affair, basically an IBM PC compatable with a touch screen, packaged for voting, with a secure case that prevents keyboard or mouse from being plugged in while it is in the polling place. The machine plugs into a network hub that also includes a UPS (uninterruptable power supply, including battery pack), and sits in a voting booth that is little more than a table with a corrugated plastic privacy screen -- this is a bare minimum voting booth, but the flat panel display screen on the voting machine has very poor off axis viewing, so the privacy is a bit better than the minimal booth suggests. 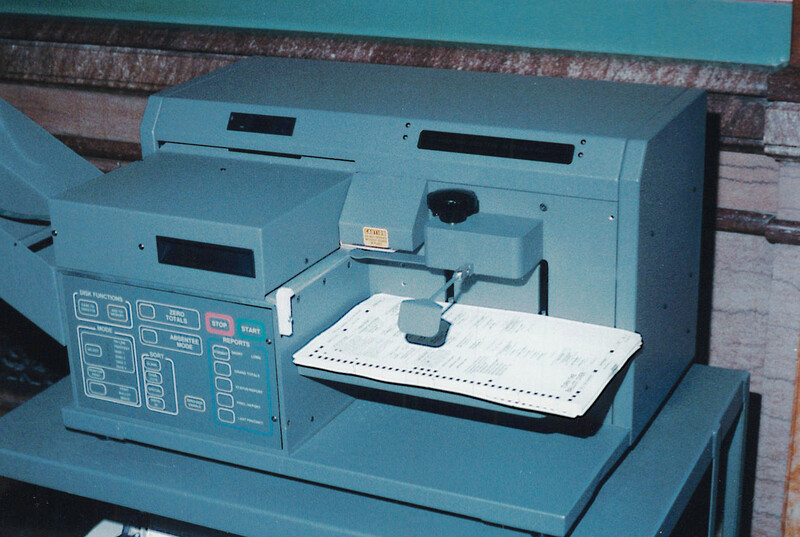 The machine in this photo was on when the picture was taken, with a ballot displayed on the screen, black text on a white background. The Global Election Systems Model 100 Electronic Ballot Station is quite similar looking, with many of the same features. To the voter, the most visible difference is that it incorporates a smartcard interface. With the EV2000, the polling place worker enables the machine with an ID code entered on the screen, while with the EBS100, each voter is given a smartcard that is good for one use. The Microvote Electronic Voting Computer represents an older generation of direct recording electronic voting machines. This uses push-buttons adjacent to each ballot item to cast votes, with a light by each button giving positive feedback that the vote has been registered. The ballot issues are printed on a paper ballot label that is protected behind a window between the rows of buttons, and the machine itself opens up and assembles into a voting booth, just as the classic lever machines did - the side privacy panels of the machine in the photo were folded into the lid at the time, in order to allow greater visibility during a demonstration of the machine. The Microvote machine has only 64 buttons, and many elections would require significantly more than this if the full ballot were to be displayed at once. Microvote has a patented "ballot paging system" that allows a ballot with up to 512 candidates or positions on issues to be divided into 8 pages for presentation. The ballot label is printed on a single scroll, with the pages printed side-by-side, and the machine contains a motor drive that advances the scroll to the left or right as the voter works through the issues on the ballot. I am indebted to Laura Rigal for her suggestion that Bingham's County Election (Figure 1) would be a good illustration. This painting was made in 1851-52, and this particular version of the painting is from the St. Louis Art Museum; Bingham produced a second version (without the dark figure directly under the judge flipping a coin) and he commissioned an engraving that was sold widly. All of the 19th century ballots shown here are in the Special Collections department of the Iowa State Historical Society Library in Iowa City. The ballot in Figure 3 is from the Dolliver papersa the ballot in Figure 4 is from the Larrabee papers. The digital images were made by the author. 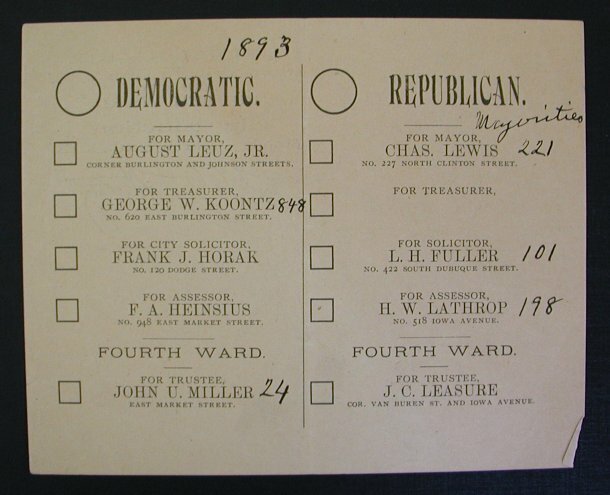 The ballot in Figure 6 is from the personal collection of Jim Dowling of Sac City, IA; he purchased it in 1997 from an antique dealer near Savanah GA. 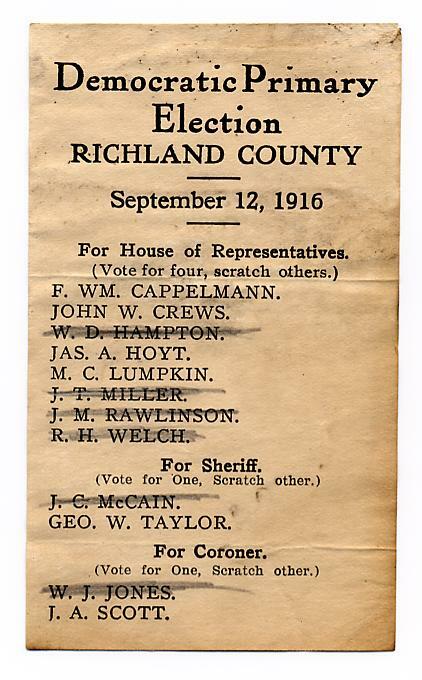 There are Richland Counties in several states, but John Wolff Crews, 1890-1962, was a prominant South Carolina Legislator and Jurist and almost certainly the John W. Crews listed as a candidate on this ballot. The digital images were made by the author. The Data Punch and Votomatic ballots and voting systems shown here are from the author's collection. The digital image in Figure 7 was made by the author; those in Figures 9, 10 and 11 were made by Ted Herman. The DataVote ballot in Figure 12 is from the collection of Kurt Hyde. I am indebted to Todd Urosevich of Election Systems and Software for his help with the early history of mark-sense voting systems. Herb Deutsch at ES&S has also been very helpful, particularly with regard to the early history of DRE voting systems. The History of Voting Machines from inventors.about.com offers an interesting history of voting. Elon Hasson's paper, How secret is your Vote? is a useful survey of many related issues. This was a student paper in Lydia Loren's fall 1999 course, Cyberspace Law at Lewis and Clark College.